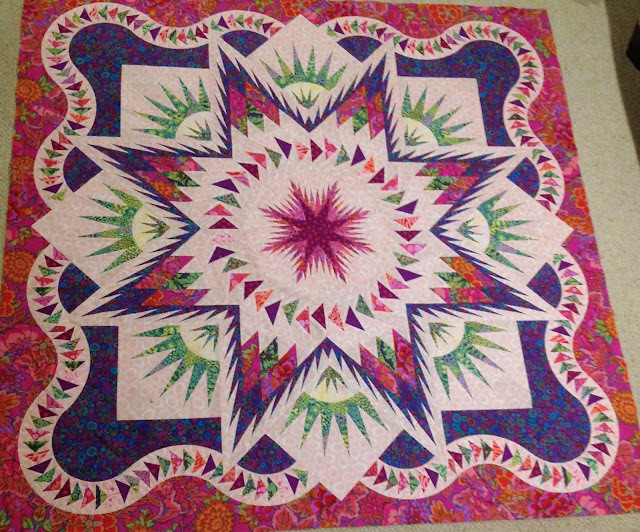 Yesterday was my last session of teaching the Glacier Star at Country Treasures in Chester, Vermont. These ladies are not only talented, funny, gracious and friendly, but some of my favorite people. I have known about half of them for some years and the other half have become new friends. Anyway, they did completely AWESOME work!! Each and everyone of their quilts where unique. LOVE THEM ALL! Here is the happy group showing off their quilts!! Well done ladies!! Sue was the over achiever and completed the Queen version. She was truly the queen!! Christy continued to plug away and got hers all complete. LOVE! Pat got off to a bumpy start, but quickly learned and did an extraordinary job!! LOVE THE PINK!! Linda had the most unique color version that I have seen... a cross between Christmas and modern... just stunning! And as you all know I LOVE KAFFE... Well, Sarah finished her Kaffe version and I totally wanted to walk off with this one. Not only is it Kaffe, but there is a good amount of pink in it!! For all the photos, and there are some really good ones from the last class, just click here to see them. If you would like to see where I will be teaching this class in the fall, 2013 and winter, 2014... just click here for my schedule!